Like several of the late Shaw plays, Geneva has a great idea at its centre – in this case a very funny look at international diplomacy and justice. John Murrell’s fun and funny adaptation begins with Belle Browning, a plucky American gal working as a receptionist at the Geneva office of the International Committee for Intellectual Co-operation of the League of Nations. She’s perhaps not the most qualified person to handle international relations. In a normally quiet office, in one day she is suddenly visited by three distraught citizens of the League who file complaints about their leaders – Joseph Rubinstein is a German with a grievance, Darcy Middleman is a Canadian with a grievance, and Doña Dolores Ochoa is a Latin American with a grievance. Responding to their complaints to the best of her abilities, she unwittingly sets in motion an international incident, culminating in a ridiculous trial at the Hague where some of the world’s most feared dictators are put on the hot seat. 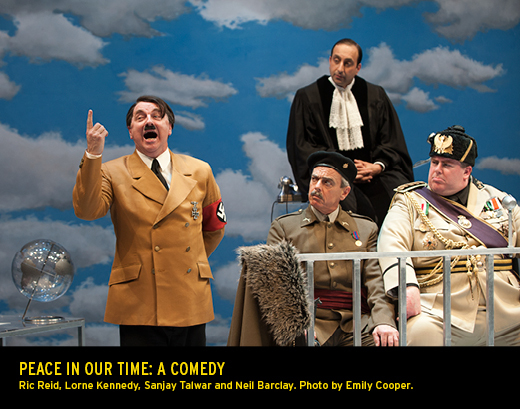 Peace in Our Time was presented at the Shaw Festival in Niagara-on-the-Lake, Canada as part of their 2013 season. The production was directed by Blair Williams, with set design by Camellia Koo, costume design by Victoria Wallace, lighting design by Kevin Lamotte and original music by Zachary Florence. Diane Konkin was the stage manager and Ivory Seol was the assistant stage manager. The production featured the following cast: Sanjay Talwar (The Senior Judge), Jeff Meadows (The Secretary to the League of Nations), Patrick Gallagan (The British Foreign Secretary), Diana Donnelly (Belle Browning), Charlie Gallant (Joseph Rubenstein), Andrew Bunker (Darcy Middleman), Claire Jullien (Doña Dolores Ochoa), Kevin McGarry (Bob Tarkenton), Michael Ball (Bishop Isling), Moya O’Connell (Commissar Elizaveta Poskaya), Neil Barclay (Il Duce), Ric Reid (Der Führer) and Lorne Kennedy (El Generalísimo). The music for Peace in Our Time was produced by Wayne Gwillim. The score uses excerpts from the League of Nations’ anthem, “Onward! Song of World Freedom”, written in 1919 by Frederick Hall (music) and William P. Taylor (words).